Fashion is definitely one of the areas where 3D printing gives literally endless opportunities for experimenting with form. The effect is that most of the designs are more theatrical than functional, not even trying to look like comfortable. However, these spectacular experiments are constantly creating challenges for the 3D printers, pushing the boundaries of this dynamically developing industry. One of the occasions to observe the latest development if the world of 3D printing was 3D Printshow in London held in the end of October. The fact that fashion is an important part of this world was highlighted by the fact that many of the design for fashion were showed during an exclusive live catwalk show open for the VIP ticket holders. Every Not-So-Important-Person could, however, admire elaborated structures and precision of print in their more static form in the showrooms. After having observed the 3D print world for a while you realise that, like in every industry, there are some names constantly recurring during the shows and exhibitions. And so there are already famous dresses by Daniel Widrig and Iris van Herpen, named one of the 50 best Inventions of 2011 by TIME Magazine. The Alchemy collection — wearable pieces of art designed by Niccolò Casas (UCL Bartlett/Academia di Belle Arti di Bologna) — is the result of a specific study on flexibility made possible thanks to 3D body-scanning technologies and prototype experiments. In fact, the technology of parametric body scans, developed first at University College London, is used by many designers to help them create complicated structures that will fit the model. These and other techniques were presented during the workshop “Digital Forms of Bodywear” led together by Niccolò Casas and Ludovico Lombardi (Zaha Hadid Architects), which for me was one of the most inspiring parts of the whole 3D Printshow. By playing with abstract shapes and scale you can achieve organic forms that could be equally suitable as conceptual design of a fancy building or even more fancy jewelery. Exciting! 3D printed hats are another curiosity in the fashion world. Probably the highest density of the 3D printed hats and hair accessories per square meter could be experienced during the Materialise World Conference last April where the collection of some winning designs was shown on the runway. All the objects were printed at i.materialise headquarter in Belgium which so far it remains the favourite printing company of the fashion designers such like Iris van Herpen or Niccolò Casas. 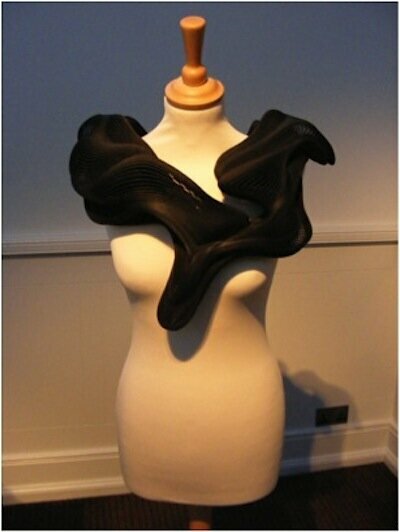 3D printed hats on the runaway during Materialise World Conference, April 2012. 3D printed shoes are another interesting initiative in the fashion world. As everything which is 3D printed, shoes can also become full customised using 3D scanning methods and designer’s fantasy to create wearable pieces of art that will perfectly fit your feet. The first couture shoe using this technology was created in 2012 by Naim Josefi and Souzan Youssouf, students of Stockholm’s two design schools. 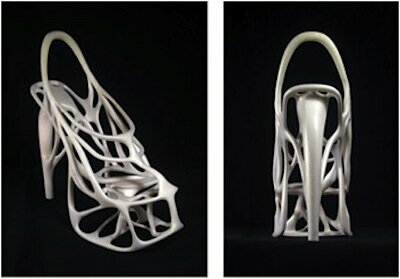 Melonia Shoe by by Naim Josefi and Souzan Youssouf, first 3D printed couture shoe in polyamid. However, the biggest printed shoe collection that I have seen so far was made by London College of Arts Digital Fashion Studio which exhibited during 3D Printshow. Fashion students from London are not afraid of experimentation with form and function, which results in an interesting mix of cosmic shapes with more casual designs some of which finally begin to look comfortable. Another 3D printed shoe design that caught my eye proves that 3D printing technology has much wider applications than just fancy dressing up. Called Happy Feet, it was announced one of the finalist of the 3D4D Challenge in London last October. The aim of the challenge was to relieve poverty though innovative technology of 3D printing. The project by Roy Ombatti and Harris Nyali from University of Nairobi’s Fablab uses 3D printing to make customised shoes for people suffering from jigger (tiny parasites that embed themselves in the feet, causing serious infections). Thus a right shoe can be made differently than a left, depending on the level of infestation. The shoes would be made from recycled plastic that can be recycled again once they are worn out. A promising solution for the poverty-stricken population that brings relieve to people affected by jigger and takes care of the environment. Fingers crossed!